WATERLOO – Is the pygmy hippo more worthy of protection from extinction than the blobfish or the hoodia cactus? And what about humans, who face existential threats from a variety of sources? How can and might humans living in diverse ecological-cultural contexts respond to mass extinction and other potentially world-threatening events? 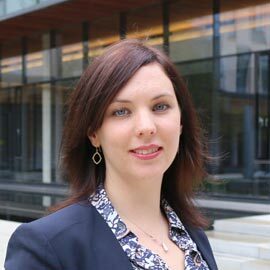 Wilfrid Laurier University’s new Centre for International Governance Innovation (CIGI) Chair in Global Governance and Ethics Audra L. Mitchell explores answers to these questions and more. Mitchell's research seeks to transform global ethics to respond to emerging ecological and/or technological challenges, including mass extinction, geo-engineering and space colonization. Her research agenda calls on people to rethink global governance in light of human intervention into planetary processes. Mitchell’s academic background is rooted in diverse disciplines including international studies, anthropology, philosophy, geography, and science and technology studies. Mitchell received her PhD from Queen’s University Belfast, UK. Prior to joining Laurier and the Balsillie School of International Affairs, she was a Senior Lecturer in International Relations at the University of York (2010-15), UK and a postdoctoral fellow at the University of St. Andrews (2009-10). Find more information on Audra Mitchell’s research.